Sensor: Sony NEX 6 gives you bigger sensor with much larger photodiode compared to Olympus E-P5, so its no doubt that the NEX 6 will give you better low-light result and more dynamic range. AF system: Olympus uses Frequency Acceleration Sensor Technology (F.A.S.T.) developed by Olympus few years back, Olympus E-P3 and OMD E-M5 camera uses the same technology (F.A.S.T System). 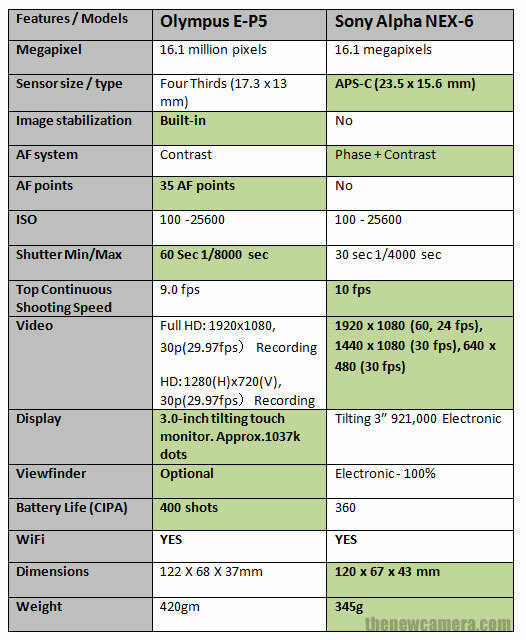 The AF speed of Frequency Acceleration Sensor Technology based camera are blazing fast, on the other hand Sony NEX 6 uses Hybrid AF system that combines Phase and Contrast detect method, NEX 6 have Phase AF pixels active during still and video mode, so both camera gives you the most advance AF system available today. Based on different lighting / test condition, Hybrid AF system (Phase+Contrast) is more recommended over contrast based AF system. NEX 6 also offers bit fast continuous shooting speed compared to Olympus E-P5. Image Stabilization: Olympus features built-in image stabilization, No IS available in NEX 6. Video: Sony NEX 6 can capture Full HD video @ 60fps, Olympus E-P5 limited to 30 fps only at Full HD mode. If I bring my OMD with for example 75 mm 1.8 lens it will beat any NEX camera with any of its lens attached it terms of focus speed and image quality and image noise.